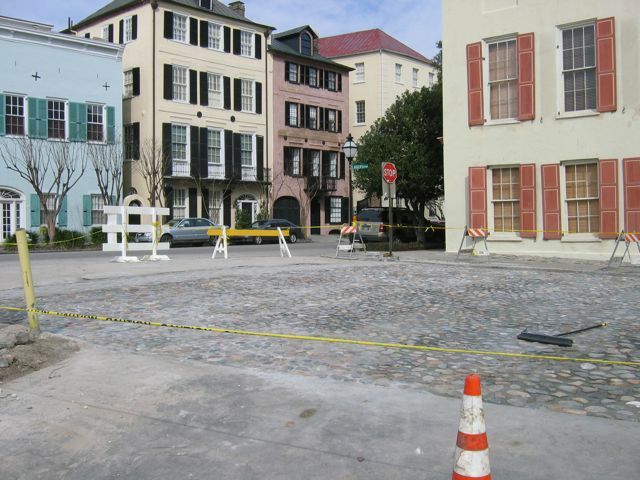 Over the past several weeks the surface of the short thoroughfare known as South Adger’s Wharf has been transformed from a patch of loose dirt to a antique-looking cobblestone street encased in concrete. 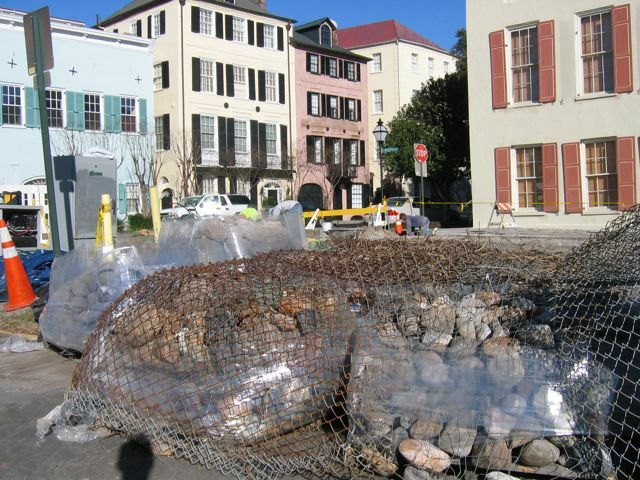 The early colonial redan, uncovered in the January 2008 archaeological excavation, was re-covered with earth within hours after the dig ended. In the weeks following, the earth above the redan was compacted and leveled in order to prepare it for a “modern” street paving. 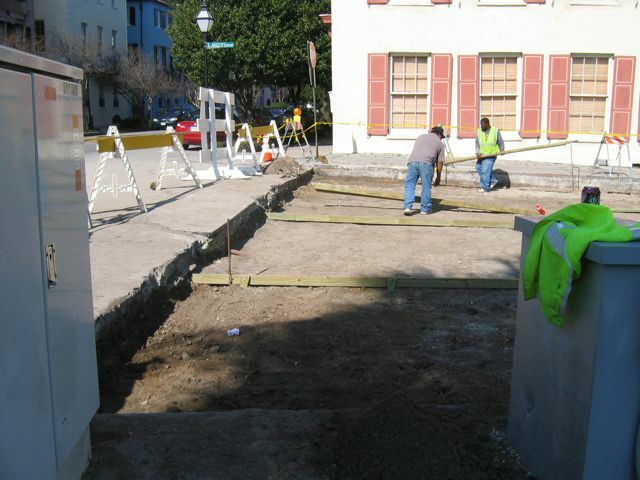 Wooden forms were then laid and a thin concrete slab poured over the entire dig site. 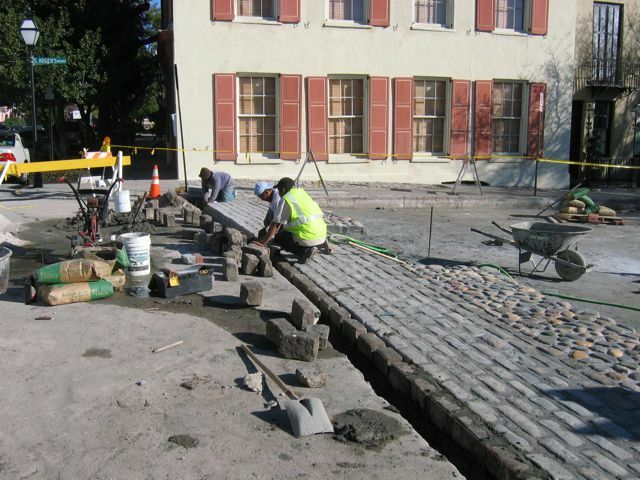 Once the concrete had cured, a crew began laying (in concrete) rows of Belgian blocks along the intersection of East Bay Street and South Adger’s Wharf. 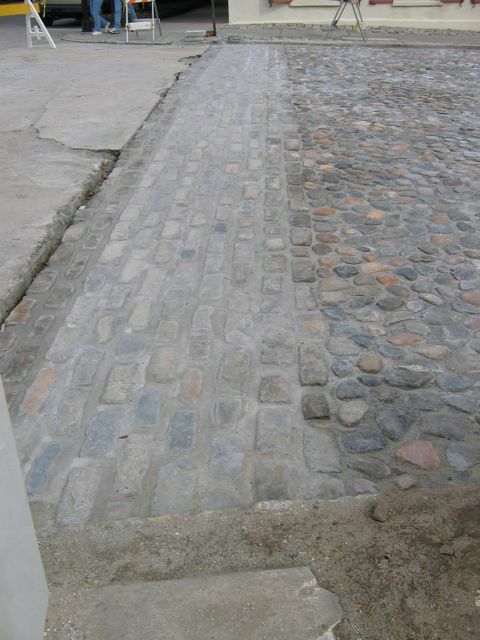 After that task was completed, palettes of odd-shaped ballast stones, the “original” (really early-twentieth-century) street surface material, were brought to the site from a storage facility. 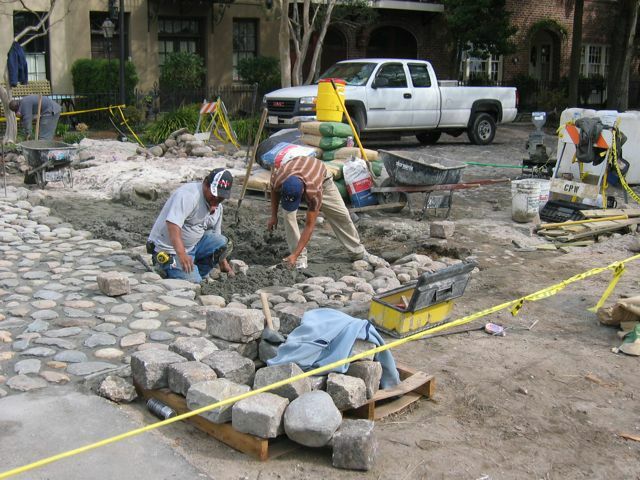 As with the Belgian blocks, the crew also used concrete to set these stones in place. 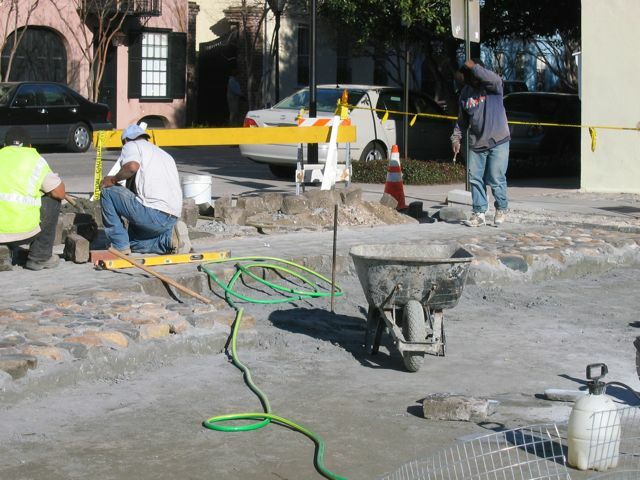 While the resulting street surface now has an attractive appearance and stable foundation, the extensive (if not excessive) use of concrete does not accurately reflect the “historical” character of South Adger’s Wharf’ and has effectively entombed the old redan against future exploration. 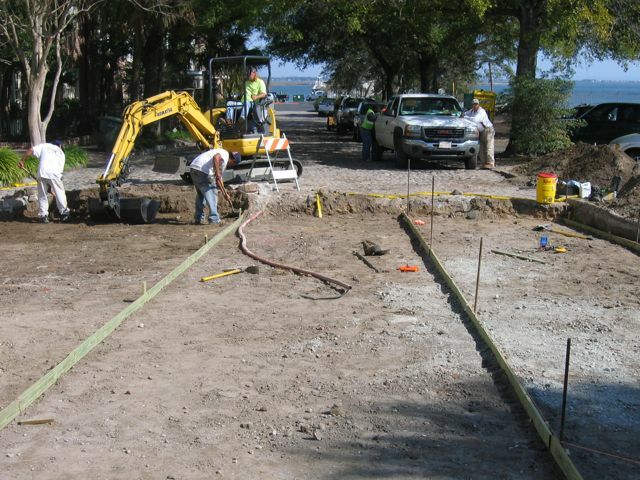 The following photos illustrate the chronological progress of the repaving of South Adger’s Wharf, from February 5th through the 21st. It’s truly a shame (with or without the “e”) that the site has to be covered over in such a way that it will defy further exploration. 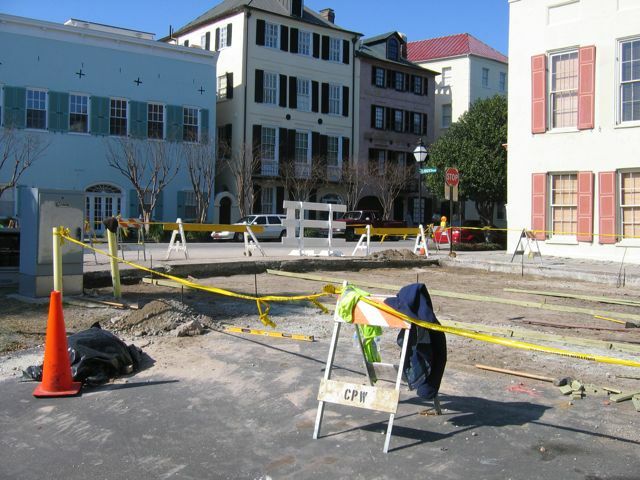 I was hoping to get a glimpse of it on my next trip down to Charleston, mainly because I love the history of the city so much. Wasn’t there any way of doing something in conjunction with the Charleston Museum to set up some type of permanent exhibit within the Museum so that people like myself could at least get an idea of what went on and what was found? It’s truly a waste! The site of the recent archaeology is covered in such a way that makes further exploration difficult, but not necessarily impossible. I think we left that site with the comfort of knowing that we learned as much as we could about the limited portion of the redan and market that we uncovered. We learned that the bulk of those structures lie elsewhere, where we’ll have future opportunities for exploration. 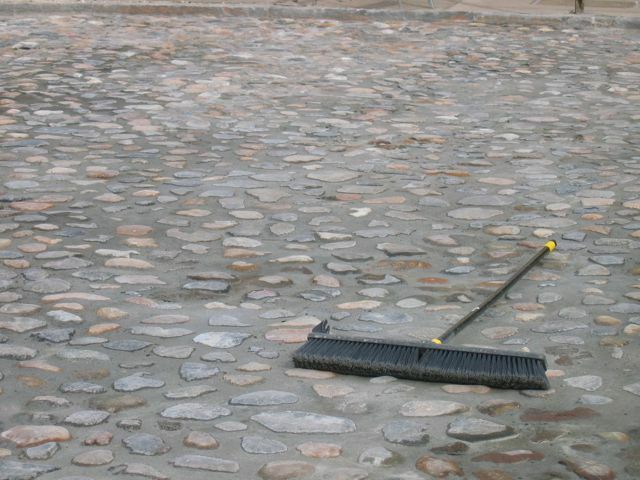 I don’t begrudge the city for paving over the site at all, but I do feel that setting the stones in concrete was too anachronistic. As for the Charleston Museum, that’s a private institution that may choose to mount such an exhibit in the future. They already have some cool archaeological material on display, and now have fragments of the redan parapet walls for future exhibition. Keep in mind, Ron, that the Walled City Task Force has no money and no budget. We’re at the beginning stages of a campaign to raise awareness and plant the seeds for the sort permanent displays you’d like to see. I don’t think anything has been wasted. We gathered a lot of data, and its going to take some time to sort through it and put together the story, images, and even models. Please understand that the Task Force members like me are donating their time for the project, and some of us are burning the midnight oil! Stay tuned!